Tuber is a botanical term for an enlarged, fleshy, generally underground stem of certain seed plants, in which the typical stem parts are represented and which often serves as an organ of food storage and/or reproduction. For example, a potato is a common tuber, being a swollen stem that stores nutrients and also has very reduced leaves and buds (eyes), from which can arise new plant shoots. The term tuber also is used in a broader sense to refer to any of various types of modified plant structures that are short and thickened to store nutrients, including roots as well as stems. For example, plants with tuberous roots include the sweet potato and cassava. The word tuber comes from the Latin verb tumere, meaning "to swell" (Katz and Weaver 2003). Tubers are used by plants to overwinter and regrow the next year and as a means of asexual reproduction. Most true tubers can reproduce the plants vegetatively, serving as genetic clones of the parent plant (Katz and Weaver 2003). In addition to serving a storage and regenerative function for the plants, tubers also provide a function for animals and humans as an important food source. Tubers have had a major role in human history, since they are nutrient rich, easy to gather, and can be stockpiled for times of food shortage. Both pre-agricultural societies, which foraged for wild tubers, and agricultural societies, which cultivated tubers, have relied heavily on these plant structures (Katz and Weaver 2003). Two different groups of tubers are stem tubers and root tubers. A Stem tuber forms from thickened rhizomes or stolons. A rhizome is a horizontal stem of a plant that is usually found underground. Similarly, a stolon is a horizontal stem that grows at the soil surface or below ground. Unlike a rhizome, which is the main stem of the plant, a stolon sprouts from an existing stem, has long internodes, and generates new shoots at the end. In general, rhizomes have short internodes; they send out roots from the bottom of the nodes and new upward-growing shoots from the top of the nodes. The tops or sides of the stem tuber produce shoots that grow into typical stems and leaves and the undersides produce roots. They tend to form at the sides of the parent plant and are most often located near the soil surface. The below-ground stem tuber is normally a short-lived storage and regenerative organ developing from a shoot that branches off a mature plant. The offspring, or new tubers, are attached to a parent tuber or form at the end of a hypogeogenous rhizome. In the fall, the plant dies except for the new offspring stem tubers, which have one dominant bud. In the spring, this bud regrows a new shoot, producing stems and leaves; in summer, the tubers decay and new tubers begin to grow. Some plants also form smaller tubers and/or tubercules, which act like seeds, producing small plants that resemble (in morphology and size) seedlings. Some stem tubers are long lived, such as those of tuberous begonia, but many tuberous plants have tubers that survive only until the plants have fully leafed out, at which point the tuber is reduced to a shriveled up husk. Stem tubers generally start off as enlargements of the hypococtyl section of a seedling, but also sometimes include the first node or two of the epicotyl and the upper section of the root. The stem tuber has a vertical orientation, with one or a few vegetative buds on the top and fibrous roots produced on the bottom from a basal section; typically, the stem tuber has an oblong rounded shape. Tuberous begonia and Cyclamen are commonly grown stem tubers. Mignonette vine (Anredera cordifolia) produces aerial stem tubers on 12 to 25 foot tall vines; the tubers fall to the ground and grow. Plectranthus esculentus of the mint family Lamiaceae, produces tuberous under ground organs from the base of the stem, weighing up to 1.8 kilogram per tuber, forming from axillary buds producing short stolons that grow into tubers (Allemann et al. 2003). Potato tubers are the development of enlarged stolons thickened into storage organs—they are specialized swollen stems (Haverkort et al. 1990; NSF). The tuber has all the parts of a normal stem, including nodes and internodes. The nodes are the "eyes" of the potato, and each has a leaf scar. The nodes, or eyes, are arranged around the tuber in a spiral fashion beginning on the end opposite the attachment point to the stolon. The terminal bud is produced at the farthest point away from the stolon attachment and the tuber thus shows the same apical dominance of a normal stem. Internally, a tuber is filled with starch stored in enlarged parenchyma-like cells; also internally, the tuber has the typical cell structures of any stem, including a pith, vascular zones, and a cortex. The potato tuber is produced in one growing season and used to perennialize the plant and as a means of propagation. When fall comes, the above ground structure of the plant dies and the tubers over winter under ground until spring, when they regenerate new shoots, which use the stored food in the tuber to grow. As the main shoot develops from the tuber, the base of the shoot close to the tuber produces adventitious roots and lateral buds on the shoot, The shoot also produce stolons that are long etiolated stems. The stolon elongates during long days with the presence of auxins and high gibberellin levels that prevent root growth off of the stolon. Before new tuber formation begins, the stolon must be a certain age. The hormone lipoxygenase is involved in the control of potato tuber development. The stolons are easily recognized when potato plants are grown from seed; as the plants grow, stolons are produced around the soil surface from the nodes. The tubers form close to the soil surface and sometimes even on top of the ground. When potatoes are cultivated, the tubers are cut into pieces and planted much deeper into the soil. By planting the pieces deeper, there is more area for the plants to generate the tubers and their size increases. The pieces sprout shoots that grow to the surface. These shoots are rhizome-like and generate short stolons from the nodes while in the ground. When the shoots reach the soil surface, they produce roots and shoots that grow into the green plant. Stem tubers should not be confused with tuberous roots, sometimes called root tubers, such as a sweet potato or Dahlia. Note that the term "bulb" refers to modified stem tubers with a short fleshy vertical stem, covered by thick fleshy modified leaves. The term "corm" refers to modified stems covered by dry scale-like leaves called a tunic, differing from true bulbs by having distinct nodes and internodes. A tuberous root is a modified lateral root, enlarged to function as a storage organ. It is thus different in origin but similar in function and appearance to a true tuber. Examples of plants with notable root tubers include the sweet potato, cassava, and Dahlia. A tuberous root serves to allow the plant to survive from one year to the next. The thickened roots are storage organs that differ in fundamental ways from true tubers. The massive enlargement of secondary roots typically represented by sweet potato (Ipomoea batatas) have the internal and external cell structures of typical roots. True tubers, on the other hand, have the cell structure of stems. In root tubers, there are no nodes and internodes or reduced leaves as in true tubers arising from stems. One end of a tuberous root, called the proximal end, has crown tissue that produces buds that grow into stems and foliage. The other end, called the distal end, normally produces unmodified roots. In true tubers, the order is reversed with the distal end producing stems. Tuberous roots are biennial in duration: the first year the parent plant produces the root tubers and in the fall the plant dies. 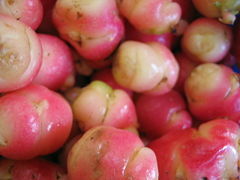 The next year the root tubers produce a new plant and are consumed in the production of new roots, stems, and flowers. The remaining tissue dies while the plants generates new root tubers for the next year. Hemerocallis fulva, plus a number of Daylily hybrids, have large root tubers, H. fulva spreads by underground stolons that end with a new fan that grows roots that produce thick root tubers and then send our more stolons. Plants with root tubers are propagated in late summer to late winter by digging up the tubers and separating them, making sure that each piece has some crown tissue, and replanting. Allemann, J., P. J. Robbertse, and P. S. Hammes. 2003. Organographic and anatomical evidence that the edible storage organs of Plectranthus esculentus N.E.Br. (Lamiaceae) are stem tubers. Field Crops Research 83(1): 35-39. Retrieved October 7, 2008. Haverkort, A. J., M. van de Waartm, and K. B. A. Bodlaender. 1990. Interrelationships of the number of initial sprouts, stems, stolons and tubers per potato plant. Potato Research 33(2): 269-274. Retrieved October 7, 2008. National Science Foundation (NSF) Potato Genome Project. n.d. Tuber formation. National Science Foundation. Retrieved October 7, 2008. Cook's Thesaurus has a good inventory of tuber varieties. Retrieved October 7, 2008.